The recent splitting of the final film in a franchise into two parts is slowing become a trend for the epic conclusions. I can’t say it’s a trend I can get on board with as it seems some films certainly suffer when being resticted as such. But somehow The Hunger Games: Mockingjay - Part 2 breaks that mold and delivers an action packed war film with just a hint of real world elements to bring the saga to an epic and worthy close. 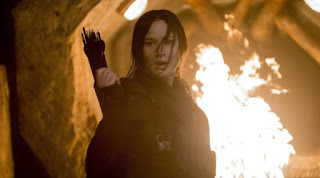 Picking up right where Part 1 left off, Katniss Everdeen (Jennifer Lawrence) is recovering but ever eager to get back into the field and with luck to the front lines of the war against the oppressive Capital and President Snow (Donald Sutherland). 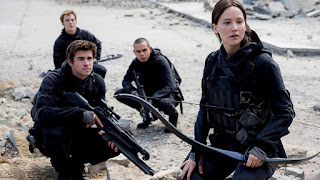 Katniss and Gale (Liam Hemsworth) must work together with Finnick Odair (Sam Claflin) and Peeta Melark (Josh Hutcherson) to infiltrate the Capital, through dangerous traps and the dangerous Peacekeepers. The film is clearly made under the assumption that the audience will have seen Part 1 prior to entering the theater for the final installment. From the opening scene everything is presented as if it is a complete continuation of Part 1. And honestly when a series of four movies comes out over four years, one would expect everyone to be caught up by the time the fourth one rolls around. The cast is all back for the final go around. There are some weak links with Hemsworth and Hutcherson being slightly underpar throughout, but others certainly bring their A-game. Julianne Moore is back as President Alma Coin, the leader of the rebellion and delivers a rather devious leader type character. Other characters from the previous films make very brief (unfortunately) appearances such as Elizabeth Banks as Effie Trinket and Woody Harrelson as Haymitch Abernathy. Natalie Dormer gets to show off her acting abilities and overall coolness with the young rebel Cressida, while her Game of Thrones co-star Gwendoline Christie is criminally underused and relegated to a one-scene role. Sutherland is just as slimy yet slick as ever, continuing to play the evil President with just the right amount of charisma to maybe make you like him, but only a little bit as he likely does something horrendous in the next scene. Then there is the star of it all, Jennifer Lawrence. It’s odd to look at where her career was when the first film was released in 2012, just a new comer who happened to get the coveted role in a new franchise. But now it’s 2015 and it’s clear she is a certified movie star and phenomenal actress, just ask that Oscar up on her mantle. The action is pretty exciting throughout. While Part 1 drifted away from the Hunger Games aspect of the first two, Part 2 delves into a full-blown war set on the stage of a gamemakers playground, and creates it’s own Hunger Games in a way. Seeing the traps, called pods in the film, take you back to the arena in a way but somehow feel more dangerous than before. Perhaps the larger stakes have something to with it. So what did you think of the final installment in The Hunger Games franchise? Have you seen it and how do you rank it among the others? Comment below and let me know and as always return to I Am Sam for weekly reviews.